TS007 - 3-Star BS Cylinders are the ultimate combination of durability, reliability and ease of use…all in a compact, versatile package. 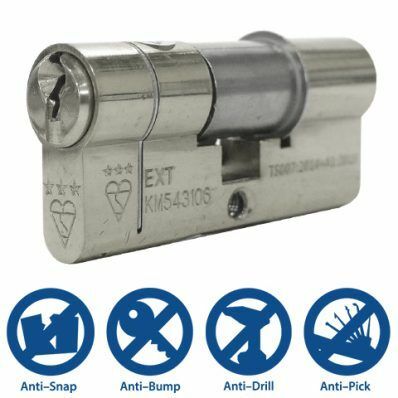 These British Standard approved cylinder locks are designed to resist contemporary burglary techniques such as “lock snapping” and protect your home while remaining easy to install and modify, like all cylinder locks. We currently have a varied range of TS007 cylinders for sale, available in a large selection of sizes to suit your chosen door and style. If you’re looking for something more affordable or low key, consider our selection of single cylinders. This is the original cylinder lock, boasting no special features or components; accessible only from the outside, these one-sided locks are ideal for application on storage devices, cupboard doors and drawers, or isolated facilities such as sheds. For the next step up, browse our compendium of key & turn cylinders. Designed to allow access from both sides, these locks sport a thumb turn on one side and a keyhole on the other, making them perfect for scenarios in which only external access is at risk, leaving the operation simple, clean and quick for anyone on the inside of the door. This makes them perfect for use on fire doors, garages, and other one doors where easy access is crucial. However, if you require something between the two extremes of the single cylinder and the TS007 cylinder, our assorted key & key cylinders may provide just what you’re looking for. While they don’t offer all of the additional security functions and resistances that the TS007 series provide, they are nonetheless a robust innovation utilised in many parts of the world to this day. Constructed from two cylinders, they too require a key from both sides - it all boils down to how much security you think your door needs. We also stock a variety of replacement rim cylinders designed for rim locks and night latches, should you wish to modify or restore a broken fixture. While the Yale cylinder is the most prominent, we carry an assortment of cylinders in various sizes to give you the greatest chance of finding one you can use. Here at Ironmongery Experts, your needs are our number one priority - all year round.